Born in Mexico City on September 12, 1941. She was motivated to study art by her first teacher, Jose Suarez Olvera, and then studied at the Universidad Iberoamericana. Some of her other mentors were Jose Bardasano and Arturo Rosenblueth whom she would marry and have three children with. She made illustrations for magazines such as El Rehilete and Zarza. Among some of her most notable awards is the third prize at a Drawing Pageant organized by the UN in 1953. Her work has been exhibited widely in Mexico and the US, in important galleries like Misrachi, Salon de la Plastica Mexicana, Instituto Cultural Mexicano (San Antonio TX), and the Museo de Arte Contemporaneo in Mexico City. She made three murals during her life. One at the Cineteca Nacional that was lost during a fire, another one at the Bosque de Chapultepec that has also since disappeared, and the last one at the Mexican Senate which is the only one standing today. Her major collector is billionaire Jorge Hank Rhon, a Mexican businessman and politician, owner of one of the major sports betting companies "Caliente" and one time Major of Tijuana from 2004-2007. 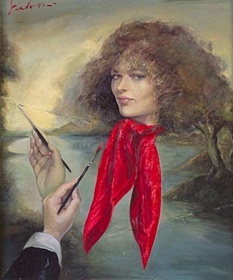 Sylvia Pardo, important feminist Mexican painter of the 20th Century died on June 7, 2008 in Mexico City.